From the opening band at Woodstock, to the girl who "couldn't" play for Bob Dylan, find out the REAL insider stories about the life of the working musician. Nightmare on Music Street! This is no "Soup" book. Do NOT take this book to bed with you! The best gift ever invented for Musicians and Performing Artists. You are not alone! Experience the seedy underbelly of the Music Industry exposed by those who have seen it, felt it and smelt it! 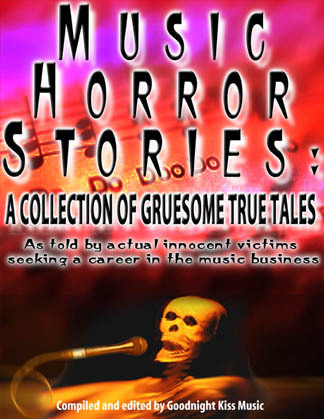 Frighten your family and scare your music friends with grim tales the publicity departments are afraid to share! Enter YOUR OWN Horror Story for the upcoming sequel. ENTRY FORM INSIDE! Now all he ever talks about is being accepted at a good college." Story: DID I SAY THAT??? 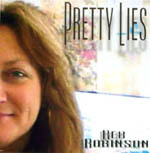 as one of L.A.'s top five "Maverick" Publishers in the LA MUSIC CONNECTION magazine. flavors and experiences are quite a feast, and for the most part told very intimately. book AND media party. I think that fun work projects are the reason our company thrives. We love what we do, so we do it hour upon hour with great passion. from the Industry through a writer's/artist's work, not through them as a consumer. Subscribe for FREE and see what our next project request is! (C) 2000, 2001, 2002, 2003, 2004 Janet Fisher, Goodnight Kiss Music. All rights reserved. NO APPROVAL FOR COPIES OF THIS PAGE, WHETHER POSTED OR SENT OR USED FOR ANY REASON AT THIS TIME. Future use allowances will be posted here.